In this guide we’ll take a look at the best outdoor toys for toddlers & kids! What Is The Best Outdoor Toy? This Little Tikes Classic Cozy Coupe Ride-On has been providing fun for little ones for a couple of generations now and has proved a firm favourite. Its simple design, bright colours and sturdy construction make it one of the best outdoor toys for toddlers that will provide hours of fun for little ones aged 18 months to 3. The Cozy Coupe features sturdy wheels, an opening door, steering wheel, cup holder and open and close petrol cap for hours of imaginative play. It can be used indoors and outside and will help your little ones develop coordination as well as getting plenty of exercise. The Cozy Coupe requires some assembly and is quite complicated to put together, so don’t leave it until Christmas Eve! However, once assembled it is a sturdy toy that will offer hours of play value and last for years. This is easily one of the best outdoor toys that has stood the test of time – becoming a firm favourite among toddlers. The Classic Swingball set includes two bats and a tennis ball attached by a tether to a pole, and it’s a firm favourite as one of the best outdoor toys for kids! This is a great toy because you can enjoy playing with your child. The swing ball can be played alone or by two people. Your child will get plenty of exercise using the Swingball and it will help them develop hand-eye coordination, too. The bats are made of durable plastic and the pole is weather resistant. Its compact size means its easy to store and transport to the park or beach. Plus, you don’t have to worry about losing the ball or hitting it over the fence! This is the lawn or beach version with a spike to insert it in the ground. There is also a Swingball available with a base that you fill with sand or water and this is suitable for use on a deck or patio. 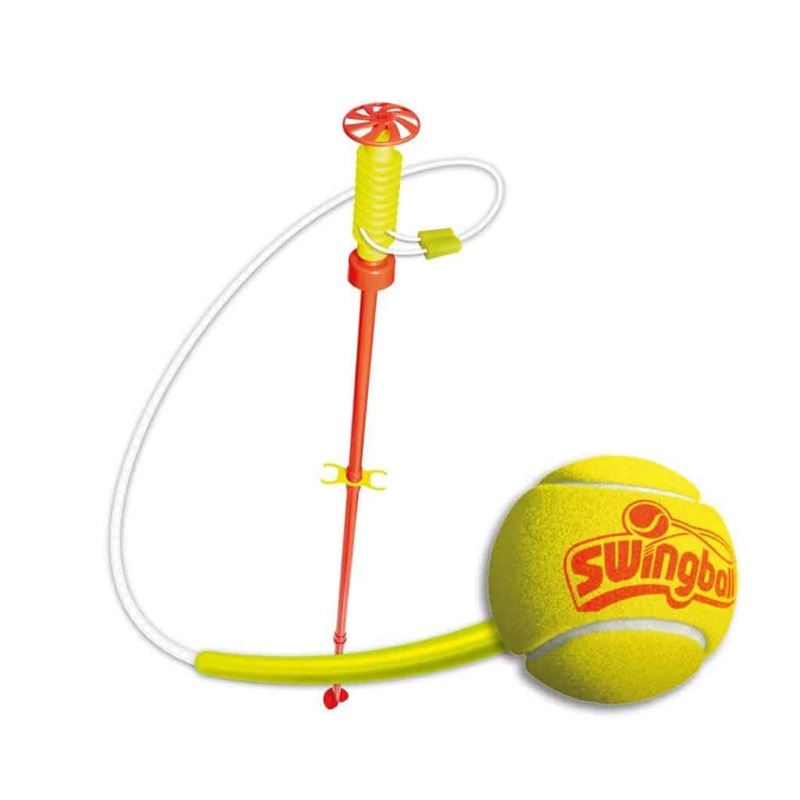 Swingball is a classic family favourite that will give you and your children many hours of fun! The Original Stomp Rocket is one of the best outdoor toys for kids that is great fun at the park or beach. The toy is simple in design and requires no batteries or power making it portable and easy to play. It is easy to set up and children simply have to stomp on the launcher which shoots a rocket soaring up into the air. It’s great fun for children and adults alike and is suitable for children aged from 6 years though even smaller kids can have a lot of fun with some help and supervision. It’s best to play with this toy in an open space such as a park otherwise you may lose the rockets. I would also recommend investing in some spare rockets when you order, just in case you get them stuck in a tree. Overall this is a fantastic toy for the price and will provide hours of fun for all the family at the park or beach. For a more refined game in the house, garden, beach or park you might want to consider the age-old favourite of Quoits. This classic Fun Ring Toss Garden Game beautifully made of wood and rope and is a simple yet engaging game for all the family from toddlers to grandparents. The paintwork is bright and yet not garish and the quality and look of the pieces make them a pleasure to use. The game is easy to put together and take apart after use. The set includes a sturdy wooden ring board and 5 durable rope rings and comes with a carry bag for easy transportation. It also includes a bonus of ten plastic rings. It’s the perfect toy to take on days out or when camping. The game is great for developing hand-eye coordination as well as improving social skills. What I love about this game is that anyone can play. It is suitable for the youngest to the eldest in the family and everyone can have a great time together no matter how agile or skilled they may be. You can even play it sitting down.s. This is a wonderful traditional toy that is perfect for at home or on holiday. The beautiful materials make it a pleasure to use for adults and children alike. It’s one of the best outdoor toys for all the family! This Nerf Vortex Mega Howler is another more recent outdoor toy that is fast becoming a classic! Of course, ball games are a perennial favourite but this one has some added features that make it even more fun to play with. The howler is a tough, foam, rugby shaped ball with a tail that is super aerodynamic and flies a long way. It also howls as it flies through the air. The ball has a nice hand grip which makes is easy to throw. It is also water resistant, so it’s perfect for use in the pool or sea. This is another highly portable and durable toy that will provide hours of entertainment at the park or beach and is easy to pack for days out and holidays. It is one of the best outdoor toys for all the family and suitable for everyone from aged 5 and up. This Aerobie Pro Flying Ring has to be used to be believed. It is so much easier to throw than a traditional frisbee so even young children can throw it a long way. In fact, the only word of warning is not to throw it too hard or you will have a very long walk to retrieve it! The original Aerobie Pro flying ring was used in setting a Guinness World Record for the farthest throw in history – an incredible 1,333 feet / 406 metres. The flying ring provides plenty of fun for all the family, but you will need to use it in a big open space such as a park or beach, otherwise, it can easily scoot over the fence or get stuck in a tree. The flying ring is great for playing catch with others and its nice and soft for little hands to catch too. You can use this toy in even windy conditions with no trouble at all. However, avoid using it too close to the sea as it doesn’t float. This flying ring will ensure you and your family get lots of exercise whilst having hours of fun! Of course, blowing bubbles is another favourite activity for children and even we adults get caught up in the fun. With this Giant Bubble Kit, you can make gorgeous, colourful, giant bubbles with ease. Small children will have great fun watching bubbles emerge that are sometimes as big as they are! Older children and adults will enjoy blowing the bubbles themselves. A slow sweep of the wand produces really huge bubbles. The kit comes with a large bubble ring, a tray for the bubble solution and a 250ml bottle of bubble solution. I would recommend that you stock up on loads more bubble solution when you buy this, so you can keep blowing gorgeous bubbles for longer. This is a great toy for some inexpensive garden fun. It’s one of the best outdoor toys for toddlers and everyone can join in the fun. For another classic game for all the family, skittles is a great option. This Paw Patrol Bowling Set is perfect for Paw Patrol fans and will encourage little ones to develop good hand-eye coordination. It good for indoor or outdoor use but you will need a nice flat smooth surface to play. The bowling pins are very small and light, but this makes them ideal for very little children as they are easy to knock over. The set contains 6 bowling pins and a ball. One of the best outdoor toys for toddlers in my opinion! Hopscotch is another favourite game that is easy to play and provides hours of fun. Of course, you can play hopscotch with just a pavement and some chalk. However, the foam puzzle pieces of this Kids Giant Foam Hopscotch Set are suitable for indoor and outdoor use and have the added play value of being a giant puzzle and a number learning game. The foam hopscotch set comes with 10 interlocking foam puzzle pieces marked with numbers from 1-10 as well as four foam marker discs. Hopscotch is a great game or helping children to learn to count as well as throwing and balancing as they hop to the right square. This is also one of the best outdoor toys for toddlers that offers great fun and learning for children. There are so many outdoor toys for children these days that it can be hard to decide what ones will be worth the investment and which are just fads that will offer little stimulation, education or play value. The best outdoor toys for toddlers offer lots of benefits. As well as encouraging children to play outside and get lots of fresh air and exercise they also help their physical, mental and emotional development. Many of the best outdoor toys help children to develop coordination, motor skills and strong muscles. Lots of them also help children practice role play and develop imagination and self-confidence. With toys that can be shared with other children or adults, little ones also learn valuable social skills. To help you choose which toys will offer the most benefit for your children and provide the most play value for the money, I have taken a look at 10 classic outdoor toys. These are toys and games that are suitable for a wide range of ages from toddlers to grandparents and they have all stood the test of time, so you can be sure your money won’t be wasted. In this list, I’ve aimed to review the best outdoor toys that have stood the test of time. I’ve also tried to include toys and games that are suitable for all the family from tiny tots to grandparents. Children do of course love it when they get to play with the whole family, so I hope that you are inspired to create lots of low-cost family fun this summer.